When reading a novel or watching a movie, many of us enjoy a surprise or twist in the plot. There are whole genres, such as detective fiction, in which such surprises are expectations, and the word whodunit was coined around 1930 for such stories. Vera Tobin’s superb, and very readable, study of surprise in plot, published just a month ago, looks at many examples drawn from literature and film. In this and the next two articles, I’m going to see how this has been tackled in narrative paintings. Verbal stories and movies have the great advantage that they are serial forms: their plots can twist and turn through time, leading the reader/viewer through the misleading and confusing, before bringing them to recognition, surprise, and plot resolution. The painter has no such luxuries; unless they tell their story in a series of images, they have to accomplish all or any of these in one, which the viewer will see in a single look. 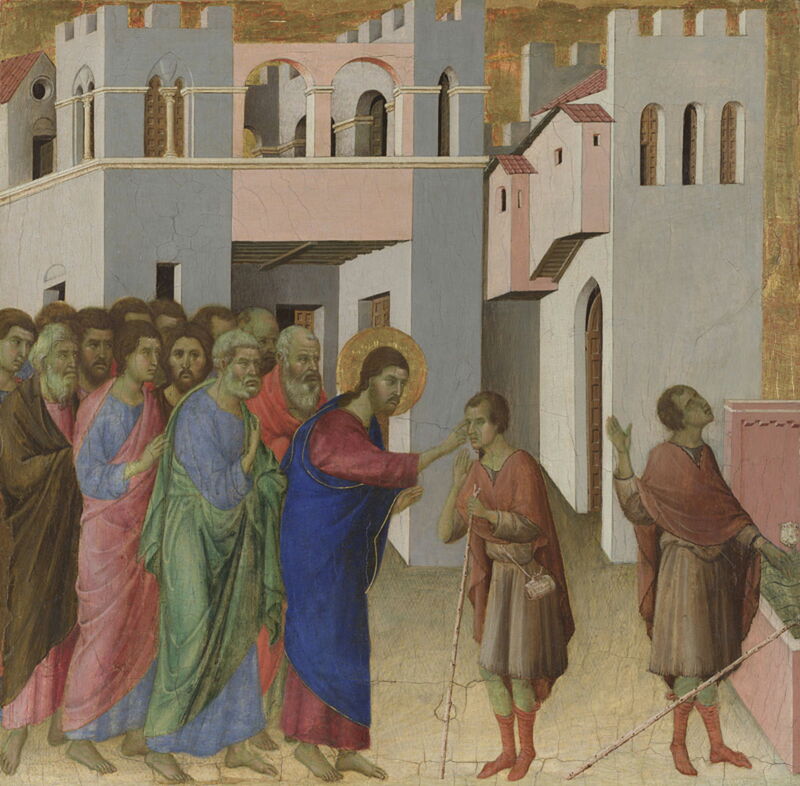 One solution is what I call multiplex narrative, in which two or more scenes from a story are shown in a single image, such as Duccio’s The Healing of the Man born Blind from his Maestà Predella Panels of about 1310. Much of the panel is taken up by the first scene, in which Christ is healing a man we know – from the Gospel story – is blind. The surprise is revealed at the right, where he is sighted, and looks up in wonder and amazement. This surprise is subtle, and not only dependent on reading the painting, but on knowing the story of this miracle. Masaccio is more sophisticated and elaborate in The Tribute Money (1425-8), one of his marvellous frescoes in the Brancacci Chapel in Florence. He packs in three separate scenes, in non-linear arrangement. In the centre, a tax collector asks Christ for temple tax. At the far left, as directed by Christ and Peter’s arms, Peter (shown a second time) takes a coin from the mouth of a fish: the surprise. At the right, Peter (a third time) pays the tax collector (shown a second time) with that coin. It took the ingenuity of post-Renaissance artists to incorporate references to multiple scenes in a single, instantaneous narrative image. One of its greatest exponents was Nicolas Poussin, whose Rinaldo and Armida from about 1630 encapsulates a lot of story and more overt surprise. The narrative is here taken from one of Poussin’s favourite literary works, a then-popular epic poem by Torquato Tasso (1544-1595), a prodigy of the late Italian Renaissance, titled Gerusalemme Liberata (Jerusalem Delivered), and published in 1581. Today, unless you’re a scholar of Italian Renaissance literature, you’ll see the surprising image of a pretty young woman on the one hand about to murder a sleeping knight with a dagger, and on the other hand caressing his brow. It is that conflict which brings surprise, albeit still subtle, implicit recognition, and reveals the twist in the plot. The sleeping knight is Rinaldo, the greatest of the Christian knights engaged in Tasso’s romanticised and largely fictional account of the First Crusade, who has stopped to rest near the ‘ford of the Orontes’. On hearing a woman singing, he goes to the river, where he catches sight of Armida swimming naked. Armida, though, had an evil aim. She had been secretly following Rinaldo, intending to murder him with her dagger. As the ‘Saracen’ witch who is trying to destroy the crusaders’ campaign, she had singled out its greatest knight for this fate. Having revealed herself to him, she sings and lulls him into an enchanted sleep so that she can thrust her dagger home. Just as she is about to do this, she falls in love with him instead – and this is the instant, the twist or peripeteia (to use Aristotle’s term), shown here. A winged amorino, lacking the bow and arrows of a true Cupid, restrains her right arm bearing her weapon. Her facial expression and left hand reveal her new intent, which is to enchant and abduct him in her chariot, so that he can become infatuated with her, and forget the Crusade altogether. Just a few years later, another of the greatest masters of visual narrative painted perhaps the most surprising work of all. 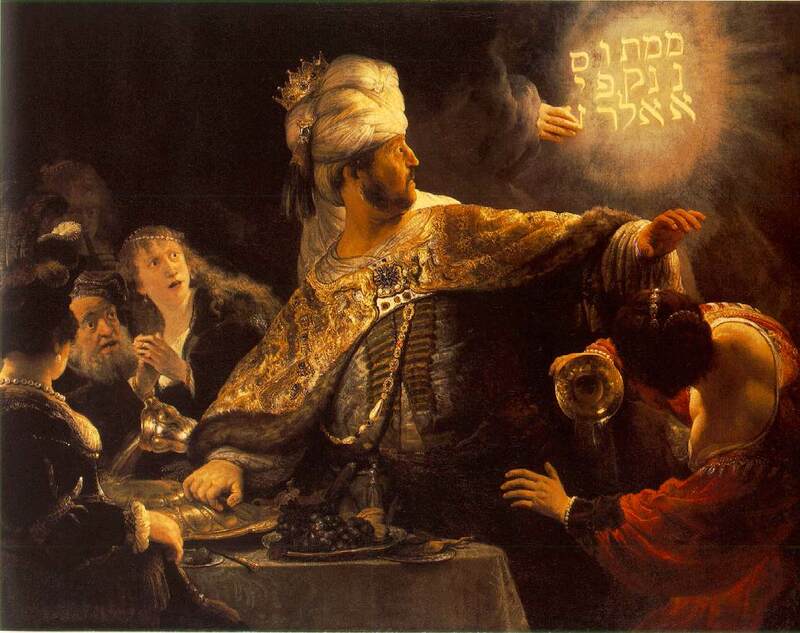 The first time that you see Rembrandt’s Belshazzar’s Feast (c 1635-1638) in the flesh, it’s a thorough surprise, in its imagery, composition, colours, lighting, and its very painterly facture. And it never ceases to surprise. 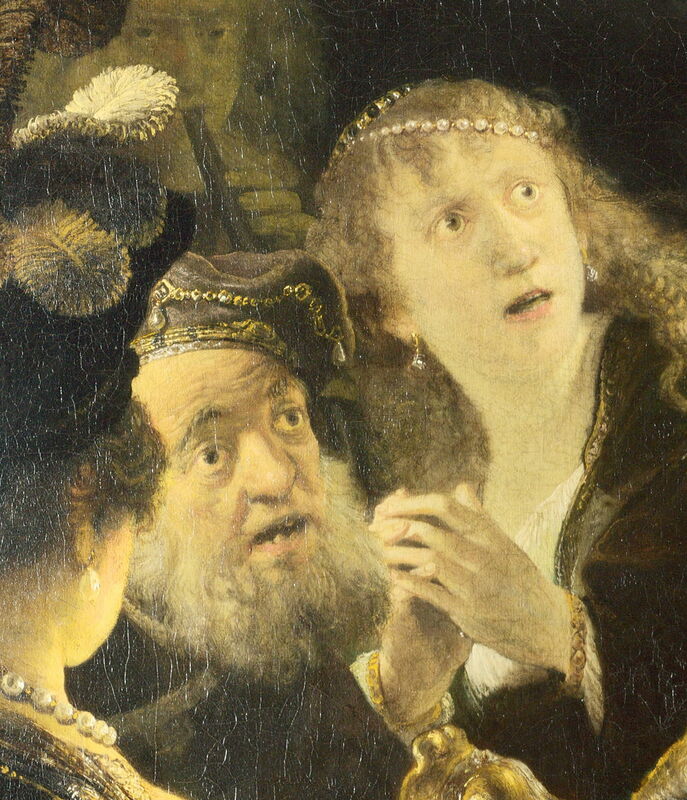 Showing a relatively minor episode from the Old Testament book of Daniel, Rembrandt creates surprise using every trick in the book. Belshazzar is a hopeless case: his father Nebuchadnezzar had his arrogance crushed when he learned of God’s sovereignty over mankind. The son is more obdurate, even when his great feast is thrown into disarray by a disembodied hand writing incomprehensible words on the wall. Daniel is summoned, who interprets the message as warning that Belshazzar “has been weighed and found wanting”; the blasphemous king is killed later that night, and his kingdom taken by Darius the Mede. 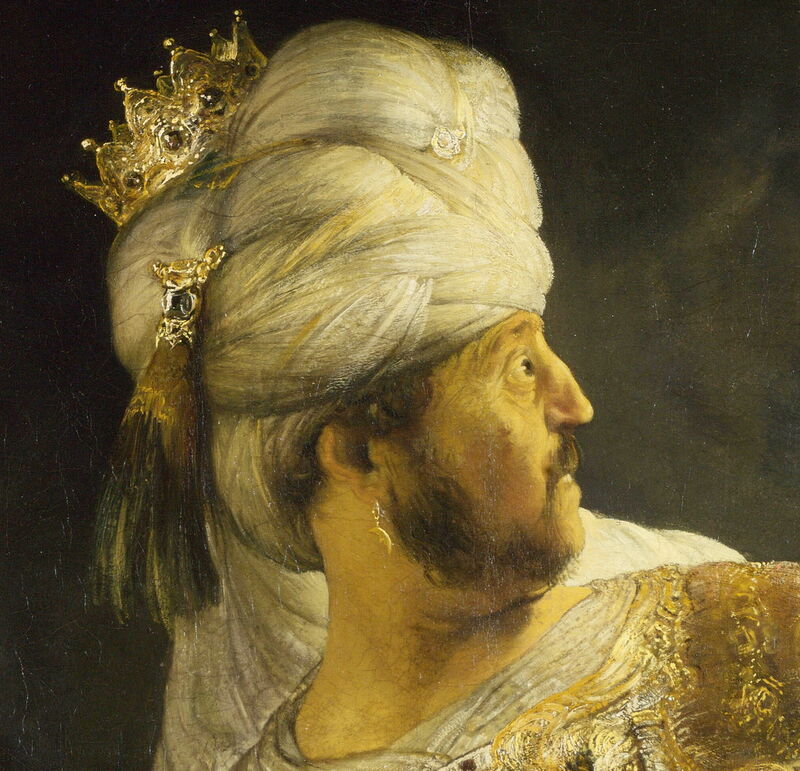 As Belshazzar watches the hand writing on the wall, his eyes are nearly popping out. His left arm is raised, and the right has to steady himself against a salver on the table, having already knocked over one of the temple vessels. A couple of the guests sat to his right show astonishment, looking not at the wall but at Belshazzar, directing our gaze at him too. 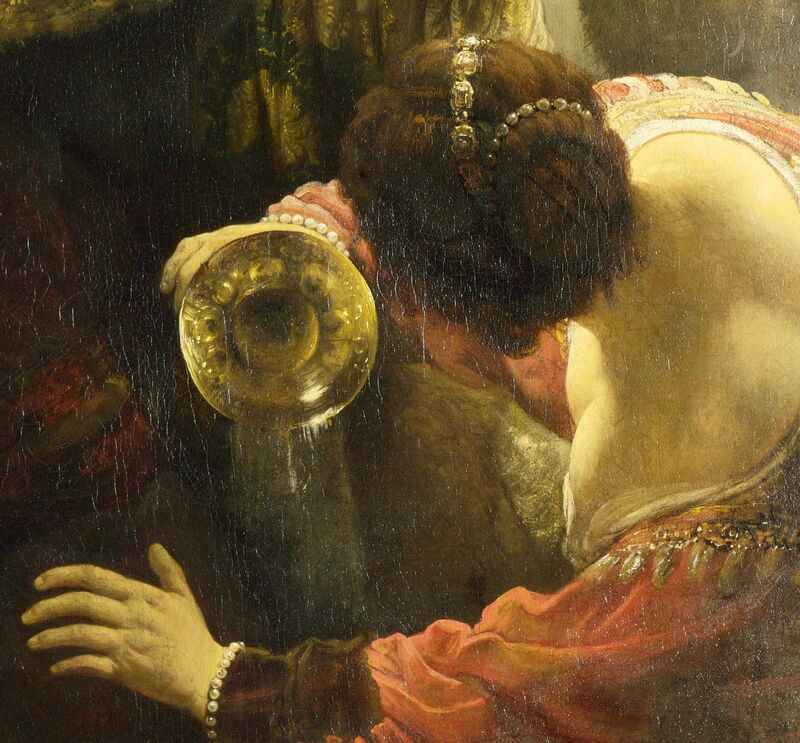 To Belshazzar’s left, a woman in a bright red robe is also transfixed by the writing on the wall, sufficient that she has tipped the contents of the goblet in her right hand onto the floor. I now skip forward over a century to an artist much better-known for his portraiture. Sleep doesn’t come easily when your twin boys are eight months old. For Alcmene and her husband Amphitryon, that sultry night was broken as one of them, Iphicles, started sobbing loudly. When his parents got out of bed to investigate, this is what they saw, as painted by Pompeo Batoni in The Infant Hercules Strangling Serpents in his Cradle (1743). Surprise is something of an understatement, for there is Iphicles’ brother, who had recently been renamed Heracles, quietly strangling a couple of snakes. At eight months. Batoni uses the cover of darkness to enhance the dramatic effect. A tiny oil lamp is the sole illumination. 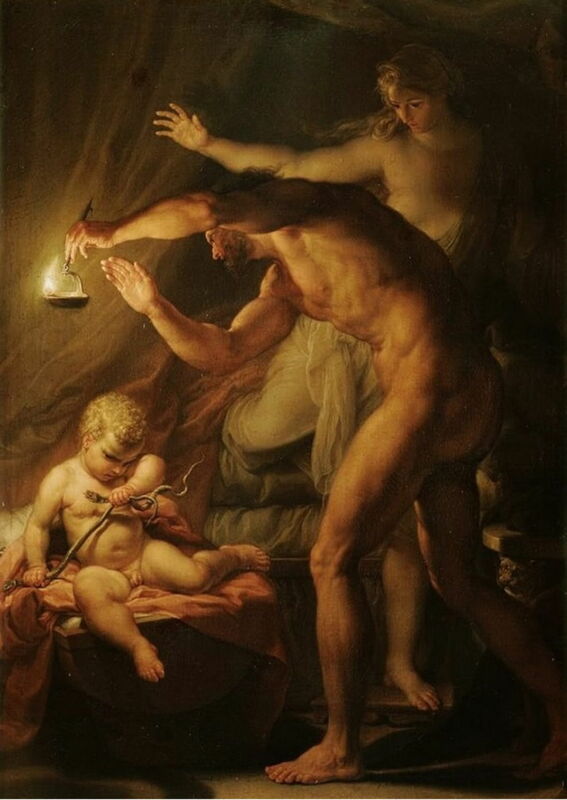 Mother and father – actually step-father, as Zeus was Heracles’ natural father – are bent over, peering through their sleep and the darkness to see what is plain to us, the most surprising infant portrait in the history of painting. There are no theatrical expressions, no wild gestures, as what you see is a complete surprise. Hera, the wife of Zeus, had given the infant the snakes in a bid to kill him, in spite for her husband’s repeated infidelity. Heracles, though, was made of sterner stuff. The night is a time for surprises, with things that go bump, ghoulies and ghosties. For Henry Fuseli, it is the time of The Nightmare (1781). 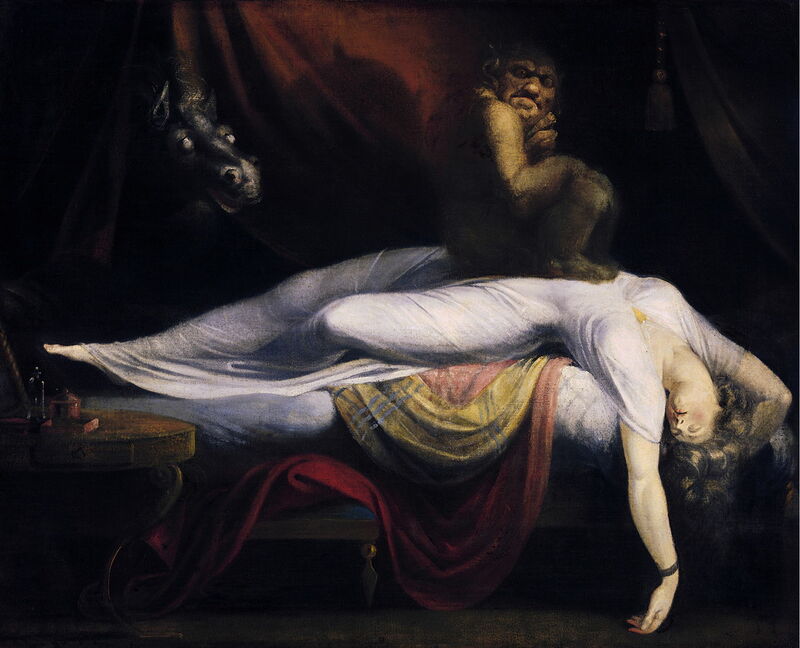 What could be more surprising for the young woman whose head and arms are falling out of bed, than a daemon sat on her abdomen, and the head of a blind black horse poking through the drapes? Thomas Rowlandson (1756–1827), Reflections, or the Music Lesson (date not known), watercolour, 11.7 x 15.7 cm, Yale Center for British Art, New Haven, CT. Wikimedia Commons. 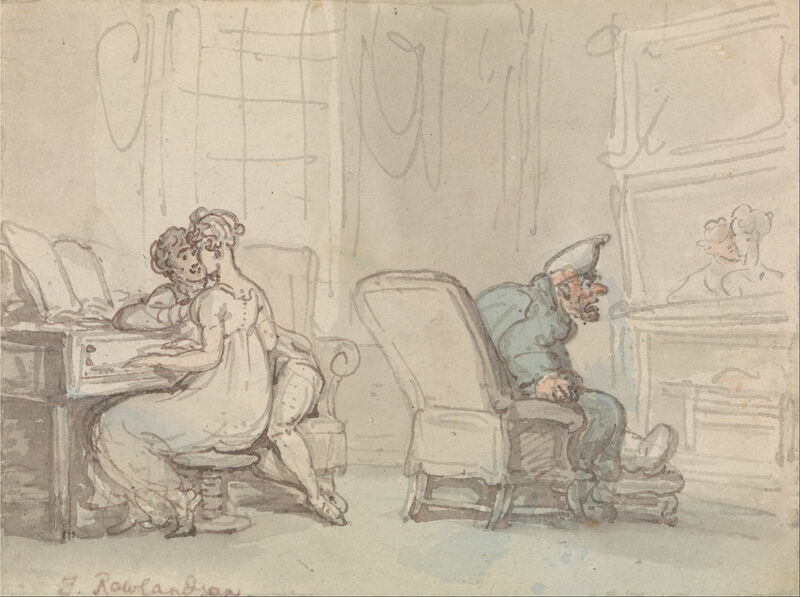 Thomas Rowlandson was an astute observer of people and society, and his undated small watercolour sketch of Reflections, or the Music Lesson is an excellent example of his work, and a good demonstration of surprise, even if its narrative is thin and brief. An old man sits in front of the fireplace, above which hangs a large mirror. This gives him a view behind of his daughter, who is playing the piano as her music teacher sits close to her. That is what we see: the image seen by the old man is of the couple embracing and about to kiss, which enrages rather than merely surprises him. James Gillray (1756/57-1815), The Hand-Writing Upon the Wall (1803), etching and hand-coloured aquatint, dimensions not known, Library of Congress, Prints & Photographs Division, Washington, DC. Wikimedia Commons. 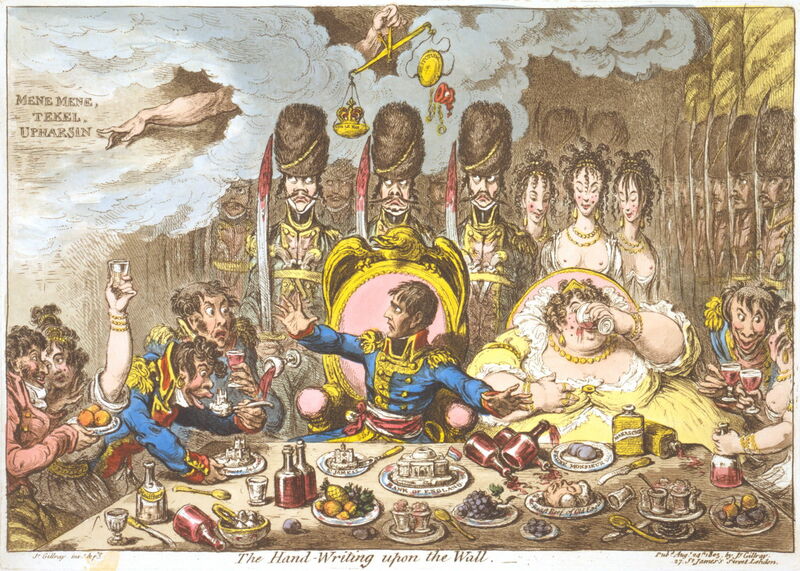 James Gillray was another perceptive caricaturist and satirist of the day. In his etching and aquatint of The Hand-Writing Upon the Wall from 1803, he borrows the story of Belshazzar’s feast and recasts it with Napoleon on the throne. Gillray cleverly quotes from Rembrandt, with wineglasses and bottles being knocked over by Napoleon’s outstretched arms, but he also uses different techniques to express this version of surprise. For example, Napoleon’s eyes aren’t about to pop out, but those of the man to the left of him, who is looking at Napoleon rather than the writing on the wall, are. Posted in General, Language, Life, Painting and tagged Batoni, Duccio, Fuseli, Gillray, Masaccio, narrative, painting, peripeteia, Poussin, Rembrandt, Rowlandson. Bookmark the permalink.